Joe is fond of pointing out the one curve in the house when a visitor wants the house tour. It's a distinctly non-curvy house: angular and more than a little masculine with all of the wood and muted colors. So the one curve does sort of stand out as different…..
Back when the carpentry crew was still working, we couldn't decide what material to use for the deep curved bench that was to go below the coat rack. We knew wanted a contiguous piece but unfortunately finding affordable, thick, deep and long in one piece eluded us. So since last winter, we've been balancing on one foot to take our muddy boots and shoes off and sitting on the steps outside to put them back on. This hasn't exactly been a inconvenience. After all we'd never ever had a seat near our back door before and thankfully neither of us has a problem balancing or sitting on the floor. But by golly we're going to get this house done if it kills us…. and honestly it looked like an unfinished hole without the bench so we knew we needed to do something. My thinking cap stayed on for a few months until at last I had a eureka moment: unfinished oak butcherblock countertop from IKEA. The perfect thickness at 1 1/2", long and deep enough to be cut in one big piece and easily done by us! Oh and relatively cheap…. the 6' section was about 85.00. Luckily we bought our piece last spring while on a trip to the DC area, because IKEA has stopped making it! What a bummer; we liked it so much that we were planning to use it for our pantry counters but now the oak is a thin veneer layer over particleboard AND the price has gone up over 20%! Since we had to cut a curve in the front, there's no way that a veneer would have worked for us. What are you thinking IKEA? Enough complaining, back to our bench which luckily is lovely solid oak strips!! so that the shape of the bench would exactly match the plaster curve above. during the cutting of the oak curve. Thank goodness Lowes is a only a short drive away! After Joe sanded it to perfection, I went to work with the finish and in about 10 days, the block was sporting several coats of Watco Dark Walnut and 5 coats of Waterlox Original. Joe screwed the cleats into the wall studs on all three sides…. And screwed the bench in from below…. It looks like it floats right out of the wall. The deep end of the curve is terrific for sitting on and not bumping into the coats above. A second curve in the house and another project off our still dreadfully long punch list! Another thing off the "punch" list! The closet in the mudroom has some awesome double doors that have looked like they'd have an equally neat closet inside of them. But until recently it's been an empty closet. Sad, very sad to have such a grand space sitting empty. from the hall bathroom of the old house along the back wall. but a wallpaper hanger I am most assuredly NOT! was as much as I wanted to do! The long"crawfish" table from Sam's makes a good wallpaper table! and used Elfa closet systems from the Container Store. to be just the way I wanted it. Having the cleaning tools and dog supplies organized again has made me SO happy! And the wallpaper is a little touch of the old house brought to Virginia! some that I wasn't sure that we'd ever use again. and unpacked the ratty black sweat pants and turtleneck. Then we drove to the edge of our property and set up a worktable on the tailgate. I sacrificed my old red rubber boots for the cause. Luckily, I'd packed up the old witches hat and mask! 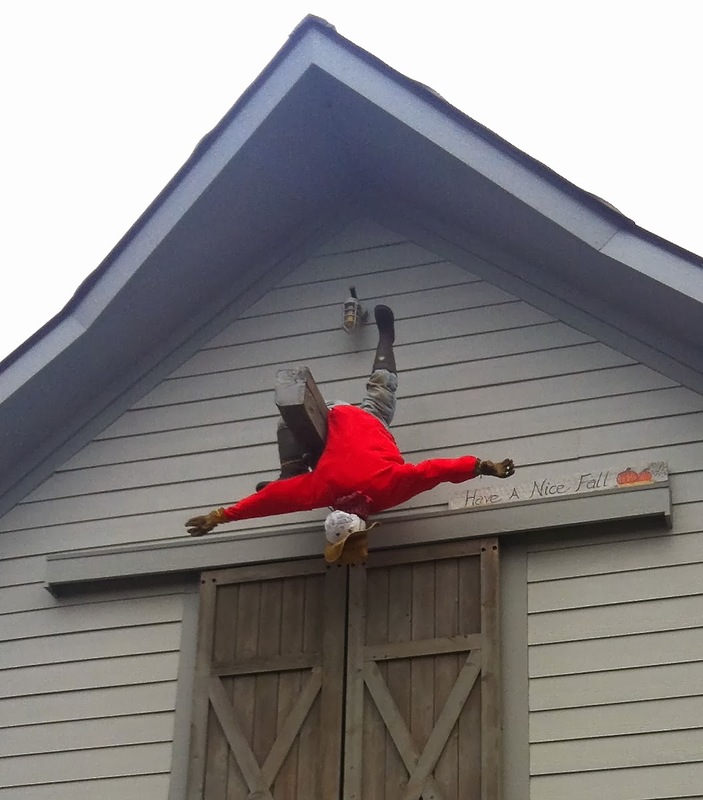 Time to recreate one of our best Louisiana Halloween decorations! Just thought we'd add a little to the beautiful scenery out here on the hill!